As a Midwestern state, Minnesota has a deep agricultural tradition. While this meant hardship and struggle for some of the state’s earlier settlers, today it means urban dwellers have ready access to farm-fresh produce, meats, and dairy products. The North Star State’s best farmers markets, though, are more than just places where farmers sell the fruits of their labors, and are actually great places to spend a few hours. Although the Minneapolis Farmers Market offers downtown dwellers a shot at its goods a couple days a week, its Lyndale Market is where the party is. Open daily, year-round (with limited winter hours), the MFM burgeons to dozens of vendors on summer weekends. You can buy fruit, vegetables, meats, cheeses, and even olive oils, while strolling under the awnings with a brat or a cappuccino from one of the many on-site vendors. Live music is a regular feature, and the Farmers Market is even a perfect place to pick out a Christmas tree. The Duluth Farmers Market has been in operation for over a century. Housed in a low-slung, red building on 14th Ave. E. at 3rd St., it’s open Wednesdays and Saturdays from Mothers Day weekend, through October. It’s the perfect place to buy a bouquet for Mom, pick a plump pumpkin for Halloween, and everything in between. The brainchild of local restauranteur, Brenda Langton, who’s known for vibrant vegetarian dishes and locally-sourced ingredients, Mill City Farmers Market opened in June 2006. The market is a zero-waste market that specializes in locally-grown and organic produce, meat, and dairy products. Its location along the Mississippi River near the Guthrie Theater makes Mill City one of the prettiest farmers markets, as well. The market is open Saturdays, year-round. From November through April, the Winter Market is located inside the Mill City Museum. The Whistle Stop Farmers Market is an ideal spot for folks in the Fargo-Moorhead area to find their fresh produce fix. The market is open Thursday evenings from July to September. Although the season is short, the market attracts local farmers with their freshest produce, as well as other hand-crafted products like jams, jewelry, and jellies. Older than the state itself, the St. Paul Farmers Market has been in operation for over 160 years. The market is located in the heart of Lowertown, near CHS Field and the Green Line terminus. It’s open throughout the year but with limited hours during the winter months. The St. Paul Farmers Market guarantees that its products are 100 percent local and offers kid-friendly activities, as well as occasional live music, so the whole family can enjoy themselves for a few hours. In a place that’s known throughout the world for its healthcare facilities, fresh, healthy produce is important. 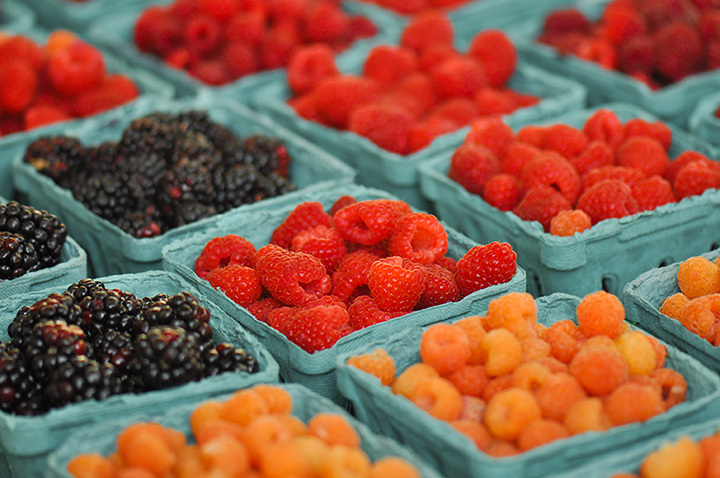 The Rochester Downtown Farmers Market obliges the city’s health-conscious appetites. With a mission to support family farms and sustainable agriculture, the market features goods produced in Southeastern Minnesota. The market open every Saturday from May through October in, as the name implies, downtown Rochester, and on select off-season Saturdays at the Olmsted County Fairgrounds. This vibrant, community-based (the first in the Twin Cities) market has a lot going on. Although its beginning in 2000 was as the precursor for Eastside Food Co-op, the market has taken on a life of its own. Vendors rotate seasonally, but in addition to sustainable, local produce, you’ll find food trucks, live music, crafts, kids activities, and perhaps even a massage or tune-up for your bicycle. The NMFM is open year-round, and its limited winter market feels like more of party than a shopping experience, complete with music and a full bar. Located in the heart of downtown St. Cloud, the St. Cloud Area Farmers Market is open seasonally, from May through October. Most of the vendors offer locally-grown produce, meats, and dairy products. While some of the products are not from the area, they are locally-vetted and carefully selected. For example, you can buy organic, fair-trade coffee beans—clearly not from Minnesota—but they are roasted and packaged locally. From May through October, Mankato residents head to the east side of town (not far from Minnesota State) to feed their cravings fro fresh fruit and other produce. All goods are substantially grown or made within 40 miles of Mankato and the market encourages the use of heirloom plants and heritage animals among its vendors. Mankato Farmers Market is open Tuesday and Thursday evenings, as well as Saturday mornings during its season. Live music and kids’ activities are regular Saturday features. This is one for Fargo-Moorhead folks to keep their eyes on. A brand new market on the grounds of Junkyard Brewing Company, co-hosted by Ugly Food of the North, NoMo Farmers Market is a potential game changer. Beer and produce? You got it! This food-only market requires vendors to plant, raise, and harvest their products within 150 miles of Moorhead. Keep an eye on the website, as they hammer out the schedule. View more Minnesota Farmers Markets.